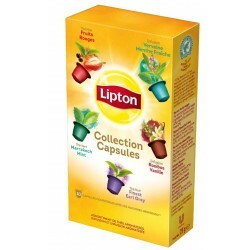 Nespresso ® compatible Lipton capsule collection. 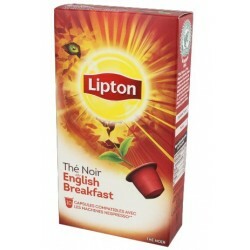 In this box of 10 capsules you will find an assortment of: Red fruits, Verbena Mint Mint, Marrakesh Mint, Rooibos Vanilla, Fin Earl Gray. 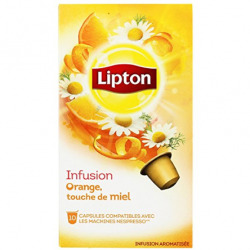 Orange Infusion Capsules honeycomb brand Lipton compatible Nespresso ®. 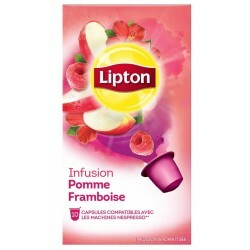 Infusion capsules Apple Raspberry brand Lipton compatible Nespresso ®. 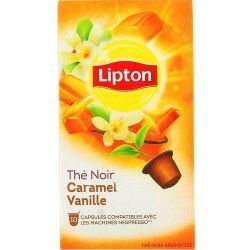 Nespresso ® Compatible Lipton Capsules Infusion night Tranquil. 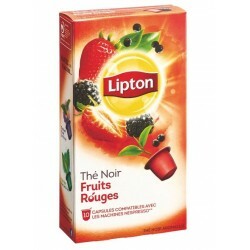 Nespresso ® Compatible Lipton Capsules Infusion night Tranquil. 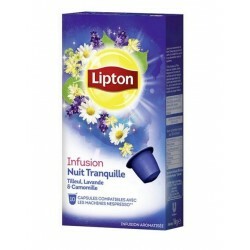 This infusion is based on linden, lavender and chamomile, plants with all the virtues for a peaceful night.